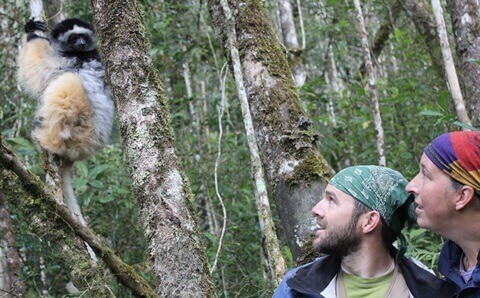 NIU husband-and-wife team Mitch Irwin and Karen Samond observe a lemur in Madagascar. A group of the world’s top lemur conservationists and researchers, including NIU anthropology professor Mitch Irwin, has published a “Policy Forum” article in the Feb. 21 issue of Science, urging emergency action to prevent extinctions of these unique primate species, found naturally only in Madagascar. The 19 article authors note that the country’s five endemic lemur families make up “the most threatened mammal group on Earth.” The situation has worsened following a 2009 political crisis that saw the ouster of the Malagasy president. Led by Christoph Schwitzer, head of research at Bristol Zoo Gardens in the U.K., the researchers advocate for adoption of an emergency conservation action plan, detailed in a document published Aug. 1, 2013, on the website of the International Union for Conservation of Nature (IUCN). 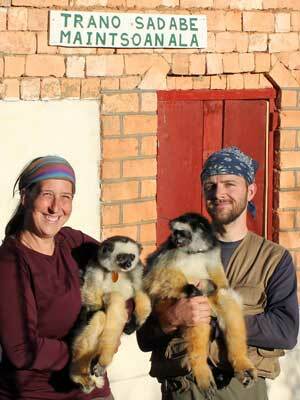 Schwitzer serves as vice-chair for Madagascar of the IUCN SSC Primate Specialist Group. Irwin had a hand in writing both the Policy Forum article and the IUCN document. 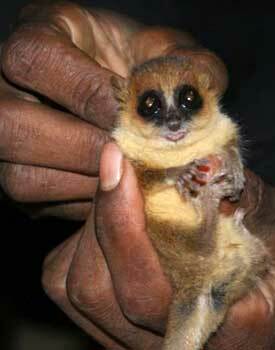 A mouse lemur trapped to collect data on population density and health. The lemurs’ habitat has been disappearing for the past 2,000 years, due to human activity, but the recent political turmoil has caused a flashpoint. According to the Policy Forum article in Science, remaining intact forest habitat was estimated to cover 92,200 kilometers in 2010, only 10 percent to 20 percent of Madagascar’s original forest cover and down from 106,600 kilometers in 1990. Much of this habitat is inadequately or not at all protected. Of 101 lemur species, 94 percent are threatened. Irwin says that some have populations of fewer than 500. The ranks of one species, known as the Northern Sportive Lemur, has dwindled to fewer than 20 individuals. “Extinctions could happen more quickly than you would think,” Irwin says. Russell Mittermeier, president of Conservation International and chair of the IUCN SSC Primate Specialist Group, co-authored the article in Science. He says there have been encouraging signs in Madagascar since the recent election of a new president, former finance minister Hery Rajaonarimampianina. The emergency conservation plan proposes actions for 30 priority sites harboring endangered lemurs, including Irwin’s research site at Tsinjoarivo, and seeks foreign financial aid to achieve these goals. a steady presence of researchers in the country, who in turn train the Malagasy in conservation and deter illegal activities.